The Lenovo Smart Display in action. "Google targets to ship some 3 million units for the first batch of the new model of smart speaker that comes with a screen," said one of several Nikkei sources. Few other details have been teased, but the product would presumably become the new flagship of Google's Smart Display platform, launched earlier this year. 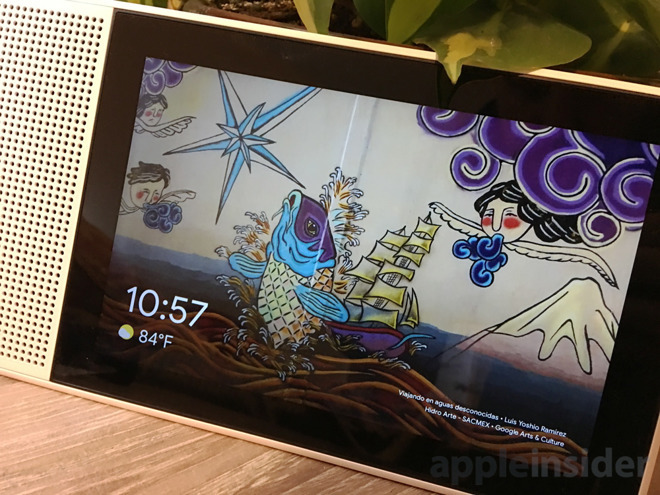 The first such hardware was actually the third-party Lenovo Smart Display. LG, JBL, and Sony are working on their own equivalents. The Smart Display platform is a branch of Google's Android Things, and mostly enhances the use of Google Assistant with visual feedback. It can also perform tasks that are hard or impossible on the audio-only Google Home however, such as watching YouTube videos and security cameras, or taking people step-by-step through recipes and driving directions. Apple is already a latecomer to the smartspeaker space, having only launched the HomePod in February 2018. Amazon pioneered the market with the Echo in 2014, and the Google Home arrived in November 2016. Apple has so far bet on raw audio quality over Siri functionality, charging $349. Rumors have swirled that Apple could ship a cheaper HomePod to combat its weak market position. There have been no rumors of a model with a display, despite the incoming wave of Smart Displays, and Amazon's existing Echo Show and Echo Spot.